Lenovo ThinkVision LT2452p 24 inch Widescreen Full HD Monitor Response Time 7 ms.
For large enterprises that demand performance, quality and green values, Lenovo introduces the eIPS panel ThinkVision LT2452p. The LT2452p offers multiple input options for hardware compatibility VGA, DVI-D and DisplayPort. A colour gamut of 72%, higher resolution and contrast ratio give you the best screen space and clarity needed to be productive. The monitor complements the speed of your ThinkCentre with fast 7 millisecond response times. Collaboration is more effective with lift, tilt, pivot and swivel features. With no comprise on quality, the LT2452p offers remarkable savings with certifications for green energy. It adopts ThinkVision's Green Grand Slam Certifications, meeting Energy Star 6.0, TUV Green Mark, EPEAT Gold, TCO Display 6.0, TCO Certified Edge 1.1 and UL Environment Gold. On top of this, it boasts lower energy consumption and a lesser environmental impact. Designed for large enterprises, the LT2452p is the perfect companion for your ThinkCentre desktops. Using a display has never been more comfortable, with exceptional on screen performance, with In-plane Switching (IPS) for wide viewing angles. Engineered with collaboration in mind, the 24" widescreen has lift, tilt, swivel and pivot capacity, allowing for high viewing comfort. The LT2452p also offers high energy savings with green certifications. Additionally, the four USB ports allow you to connect portable devices directly to your screen, adding expansion options to your PC. The LT2452p widescreen monitor is the right choice for those who need an ultimate display to increase productivity and ease of use. High contrast ratio on a 24" inch display makes working easier and drives productivity. Fast responses and multiple eco-friendly certifications allow you to save on time and energy costs. Wide viewing angles and lift, tilt, swivel and pivot capacity allow you to share data and innovate with ease. 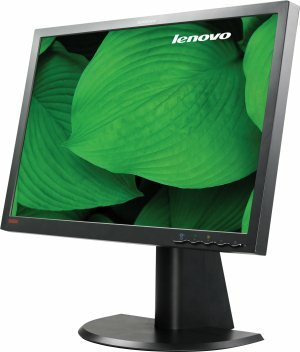 Lenovo ThinkVision LT2452p - LED monitor - 24"